This is the second installment of a two-part series out of Nepal. Read the first installment here. JANAKPUR, Nepal — Siddhartha Shishu Sadan Higher Secondary School was in a state of disrepair. Unused desks and chairs were covered in dust and cobwebs in the classroom, and the dates of school schedules put on announcement boards reflected over three months of shutdown. The only people there were a guard and the headmaster, waiting for the school to be reopened. By November 2015 when he returned to his hometown of Janakpur in the southern plains of Nepal, Ravi Kumar had had almost a decade of experiences in the United States that made him a different person. Seeing the school he had attended as a high school student put into perspective what the students in Janakpur, which had become a hotbed for violence and clashes with the police since July, were facing. It had been nearly 100 days since the schools closed following protests from the Madhesi ethnic group, who felt that they had been marginalized by the new constitution promulgated in September. Protesters had called for a complete economic shutdown of the region, and children were caught in the crossfire of the political struggle for rights — something that Kumar, 28, told NBC News he knew had to change. “The entire society is going to be put at risk if we continue this path that prevents people from getting skills,” Kumar said. On Nov. 13, his third day back in his hometown, Kumar met with the presidents of the local chapters of various political parties responsible for the protests that were keeping children out of school. According to Kumar, the leaders of these parties felt that the involvement of children was unfortunate, but necessary in order to maintain tensions with the aim of pressuring the government into making amendments to the new constitution. “Anything that seems as normalcy to them, they see it as weakening their movement,” Kumar said. This form of protest, known as “bandha,” is not uncommon in South Asia. Translated into English as “strikes,” bandha often results in businesses being forced to go on strike by political parties. Defying the strikes puts their business at risk of physical harm. Kumar said by framing the protests as a negative impact on the children, the leaders were responsive. But outward change of these policies was something, they said, that could only be brought under consideration. Change, Kumar realized, was not necessarily going to come from the top, but from the protesters themselves and the ways in which they voiced their concerns. “I wanted to find a way [to] get the people on the ground together in a way that is more constructive and that is likely to generate a sense of legitimacy, authenticity, and empathy,” Kumar said. He organized an event on Nov. 13 at Janakpur’s historical Janaki Mandir, a colorful Hindu temple that sits at the heart of the city, both geographically and in terms of historical and cultural significance. The plan was to give citizens blank pieces of paper on which they could write a message to Nepalis living in the hills above the Terai. Passers-by were asked to answer questions such as “What do you want in Nepal?” and “What needs to be done to resolve the crisis?” Citizens were told that their messages would be posted on social media under the hashtag #MadhesSpeaks. What emerged were messages that were largely positive and that called for an appeal to feelings of brotherhood and shared history. Kumar said the campaign produced a positive result, and follow-up events were created in other cities around the Terai. The next week, a similar event was held in Kathmandu under the hashtags of #NepalSpeaks and #KTMwithMadhes to reciprocate the peaceful appeal for a shared identity. It was a new form of protest that began with communication. On Nov. 22, after daily efforts to bring a positive impact to Nepal, Kumar boarded a plane and retuned back to his fiancée and his life in Washington, D.C. On his last day in Janakpur, the United Democratic Madhesi Front (UDMF) made a decision to reopen schools in the Terai. 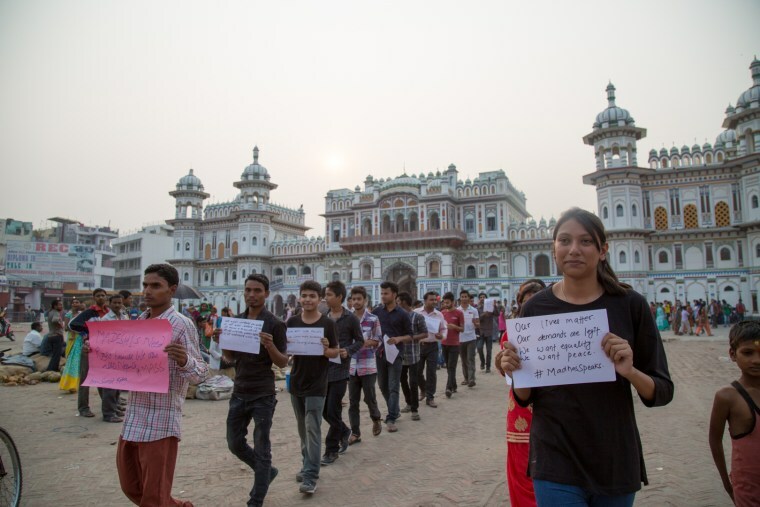 But the joy of progress was short-lived: last Sunday, protests intensified with the tabling of a new constitutional amendment that Madhesis felt did not go far enough to address their concerns and, one month after reopening, schools in Janakpur were closed again. As the struggle for Madhesi rights continues, political parties have made it clear that this movement will go on for as long as it needs to in order to have their concerns addressed. And although the goal of bringing a stable learning environment to children is ongoing, Kumar remains devoted to spreading ideals of freedom and equality in regions that need it most.